The court has permitted members of the Women of the Wall organization to read from the Torah at the Western Wall plaza, but they are still unable to do so. Following the Jerusalem District Court's precedent ruling, allowing the Women of the Wall to pray at the Jerusalem holy site according to their custom, members of the liberal organization are seeking permission to bring in their own Torah scroll, which they are currently banned from doing according to the holy places regulations. According to the women, the court's interpretation of the High Court decision determines that they may read from the Torah in the women's gallery at the Western Wall, but rules set several years ago by Western Wall Rabbi Shmuel Rabinowitz prevent that option technically. The regulations the women are referring to prohibit any worshipper from bringing a Torah scroll into the site from outside, allowing worshippers to use the scrolls located in the site only. Yet all Torah scrolls – more than 100 – are inside the men's section and are not accessible and available to female worshippers. Attempts to donate a Torah scroll to the women's gallery have been curbed in the past. The women's organization claims that the rules pertaining to every visitor were directed at female worshippers in the first place. As evidence, they note that the regulations were set in 2009, shortly after Women of the Wall Chairwoman Anat Hoffman was detained following a person's attempt to hand her a Torah scroll from the men's section. "On the one hand, we are allowed to read from the Torah, and on the other hand we are not allowed to bring it in," a Women of the Wall member explained the absurdity. "In other words, only if we bring along a Scriptures scribe who will write the Torah on a parchment within the Western Wall – only then will we be allowed to fulfill our right to read from the Torah." Now, following the District Court ruling, the women are launching a new battle. It began with a Facebook campaign calling on Prime Minister Benjamin Netanyahu to instruct Religious Affairs Minister Naftali Bennett and Justice Minister Tzipi Livni to use their authority to change the holy places regulations and remove the clause preventing them from fulfilling their right to read from the Torah, which has been recognized by the court. The organization chairwoman has even called on her friends and supporters of the female quorum to join the struggle and appeal directly to the prime minister. "We need your help," she says in a clip posted online, clarifying that Bennett and Livni are expected to "intervene and fix this outrageous injustice immediately." "It's the main course; without it we don't have the ceremony as we want it. Without reading from a Torah scroll we don't have a bat mitzvah either. We won't be able to perform a bat mitzvah ceremony for girls wishing to do so." Attorney Einat Hurvitz, director of legal and public advocacy at the Israel Religious Action Center, who represents the Women of the Wall, said that "in light of Judge Moshe Sobel's ruling, there are two options: One, canceling the procedure as it contradicts the ruling; and two, ordering a new interpretation of the procedure which fulfills the new ruling." Rabbi of the Western Wall and Holy Sites Shmuel Rabinowitz said in response that the regulation under discussion was aimed at preventing the theft of Torah scrolls from the Western Wall following several incidents, and was not directed at the Women of the Wall. Rabinowitz added that the regulation affects worshippers of all sectors – men and women, Orthodox and Conservative – who wish to bring Torah scrolls into the site and use them for celebrations and bar mitzvahs, but are not permitted to do so. A source in the Western Wall added that the site's management was not responsible for the Women of the Wall's distress, and that "even if they have a legal right to read from the Torah, it's not the site's job to give them a scroll. "They can try to take a Torah scroll from the men's section. It's like the Western Wall does not provide each worshipper with a prayer shawl or tefillin." 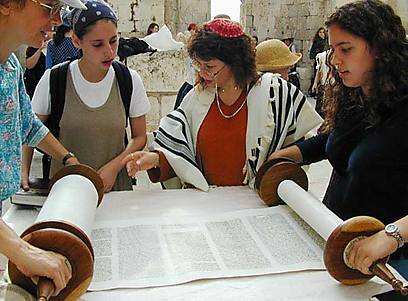 See all talkbacks "Women of Wall want their own Torah scroll "